On the night before Former FBI Director James Comey testified about Russian election hacks, Garry Kasparov, the Russian chess champion, said in Woodbury Wednesday that nothing surprised him about Vladimir Putin. 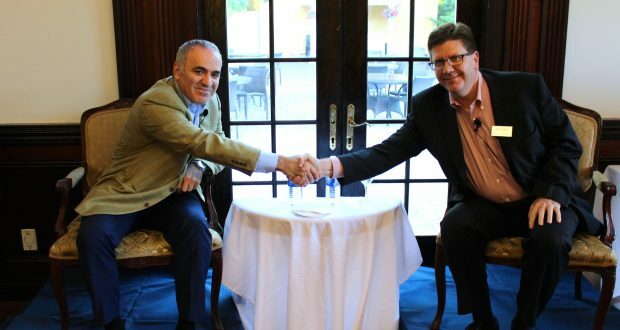 Kasparov made these remarks at an event by CMM International division of Campolo Middleton & McCormick, the law firm headquartered in Ronkonkoma. A fundraiser for the Human Rights Foundation, the event was the first in a series aimed at bringing global-matter discussions to Long Island. Kasparov is chairman of HRF, a nonprofit that aims to protect human rights in closed societies. Speaking about his book Winter is Coming: Why Vladimir Putin and the Enemies of the Free World Must Be Stopped, Kasparov also shared insights on world events, chess and artificial intelligence. And politics flowed naturally from chess. “I was introduced to politics because I could see at an early age, that as chess world champion, I could help people overcome fears and build a better country,” he said. Kasparov has long stood in opposition to Putin. And he noted that the United States has lost its stature over time. In hosting the event, the law firm aims to educate Long Island business owners about international business, legal, tax, regulatory, and important foreign affairs issues. A spokeswoman for the firm said that its additional sponsors – Sasserath & Zoraian, Investors Bank, the Claire Friedlander Family Foundation, Protegrity Advisors – helped raise funds for HRF. Bernadette Starzee contributed to this report. Read it on LIBN‘s website. View photos from the fundraiser.